Internship and apprenticeship opportunities available. Over the years, I have taught all manner of workshops, delivered keynote addresses, and presented countless seminars. Although I am still available for travel to teach, “taking the show on the road” has become more challenging. Plus, now that I live in beautiful Montana, have a lovely studio with 3 looms AND have accommodations for 2, I am pleased to announce Weaving Vacations, tailored just for you. I have discovered that most weavers I know have trouble weaving without a plan. In weaving, there are 3 basic elements in play: color, pattern, and texture. In design school, I was taught to feature just one of the 3. To have all 3 elements equally strong will make a weak cloth, designwise. Most weavers seem initially drawn to pattern. Let’s face it, it’s the closest thing to magic I know of! Many weavers I have encountered seem to struggle with color. Fortunately, that has always been my delicious joy. Then we come to texture! Texture has always been in the background for me although yarn is first and foremost, texture. SAORI gives texture its due since loom created pattern is strictly limited on a 2 harness loom. I happen to have an amazing collection of recycled cashmere which will be available for weaving. Rather than go into detail, please follow this link to see the story of recycled cashmere. One of the best features of the Saori loom is that anyone can sit down and weave on it (and I do mean anyone who can count to 2 and reach the treadles) with just 2 minutes of instruction. Weave on all three looms. They will be warped and ready to go. 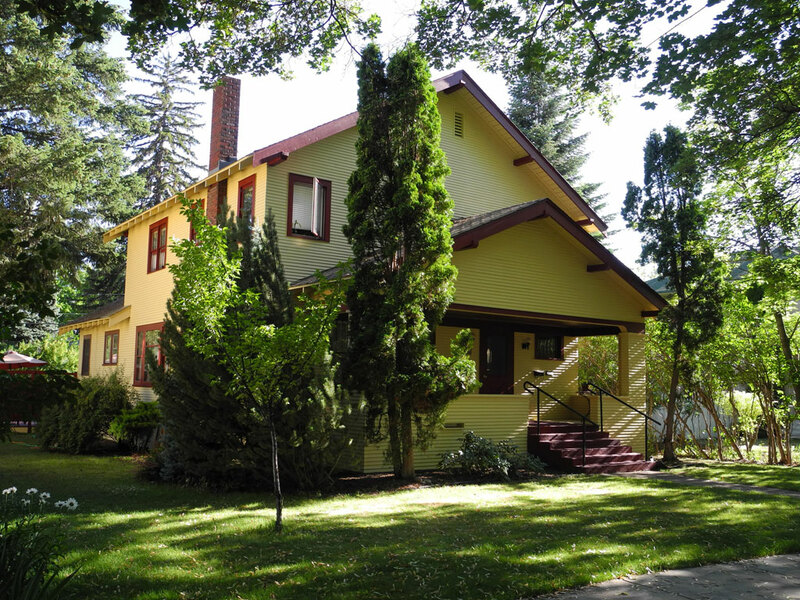 My craftsman style home/ studio is situated on lovely maple lined street, just blocks away from the University of Montana campus. The 85 year old trees provide cooling shade inviting all to stroll the charming neighborhood. I have 2 guest suites, each with their own private bath. (the downstairs has just a shower). The ground floor has a double bed with a full bath. During the summer in Missoula and surrounding areas, there is some of the most beautiful scenery and constant festivals, farmers markets, craft markets, rafting, fishing, birding, and powwow to name a just few things. In addition to loom time, one can drink in the Montana scene. We also have a wonderful yarn shop, Joseph’s Coat and Mountain Colors is less than an hour away. A little over an hour in the other direction is Black Wolf Ranch, an amazing Alpaca ranch (no wolves). Many lovely restaurants and the downtown are in easy walking distance from my University District home. 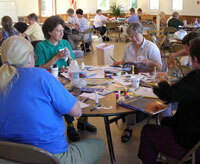 Bonnie Tarses has been teaching workshops and seminars around the US and Canada since 1993. With her amazing mastery of color blending and delightful sense of humor, Bonnie receives rave reviews. Her wide variety of workshops are geared to all skill levels, plus weaving related workshops for the non-weaver as well. Discover a unique method of color blending. The focus is entirely on color. Bonnie begins instruction via email 2 months before the scheduled workshop. Personal winding drafts are calculated and mailed out based on information provided by the student . Guidance in individual yarn selection provided via email. Warps wound and looms dressed in the comfort of your own studio prior to the workshop. Students arrive in class with looms warped and ready to weave. 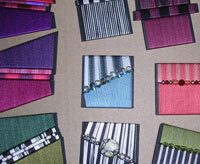 Weaving provides the backdrop for an array of unique color exercises. The number of students is limited only by the size of the room. Presented as a 1-day, 2-day or 3-day workshop, your choice. Instruction on Almost Ikat included in 2-day workshop, and Woven Words included in 3-day workshop. An intriguing color system calculated to inspire fearless colorful warps! The 1-day workshop begins with an exciting display of woven word examples. Just imagine a color name draft! With a color and number for every letter of the alphabet, you have opened the door to woven words. Students learn a beautiful wrapping technique, wrap their names, and transfer this color sequence to a weft-faced weaving. After having woven their names, students have an opportunity to weave family names, a personal motto, or a short poem. Perfect for towels, baby blankets or just about any striped warp. Supply fee: $15 includes yarn, wrapping cards, and handout. Students bring warped loom, 10/2 cotton, solid jewel-tone, 6″ wide x 3 yds. Through focused intention discover the colors of your hopes and dreams. With no experience and minimal supplies, transform color preferences into collage. Turn collage into meaningful “thread” and thread into a powerful woven statement. Guaranteed to fill you with ideas! Learn how to make perfect wrappings using custom dyed, space-dyed and ikat dyed fine silk yarn. In a 1-day workshop, student will complete at least one brooch and more likely three. In addition to the brooch, as a group we will create an exciting piece of wall art. Supply fee $30 includes a variety of pre-cut shapes, over 100 shades of 20/2 to 60/2 silk yarn, all adhesives and findings. $600 per day plus travel, room and board. I am a Bonnie Inspiried Weaver!